The relationship between HIV and disability is complex, but critical, because disabled people are vulnerable to HIV infection, while people living with HIV are at high risk of impairment. But this relationship remains largely unexplored in disability studies, epidemiology, global health, development and associated fields, and disability issues have been largely neglected in global and national HIV policy responses. The continuing lack of data on HIV prevalence among disabled people globally obscures their specific needs and requirements in accessing HIV prevention, treatment, care and support services. This chapter discusses conceptualisations of disability, bodies and health identities. We then examine disabled people’ vulnerability to HIV, including violence, stigma and access to sexual health and HIV prevention and treatment programmes. 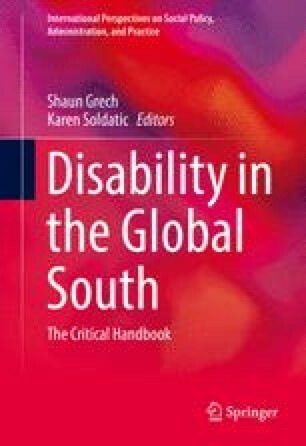 We focus on the relationship between disability and HIV in Sub-Saharan Africa, the continent that has been most affected by the HIV epidemic to date, and examine recent policy initiatives by disabled people’s organisations and networks of people living with HIV to tackle discrimination to advance their claim for the right to health in the differing local and national contexts of Ghana and Uganda. ACDHA. (2008). Kampala declaration on disability and HIV & AIDS. Declaration adopted by participants of second meeting of the Africa Campaign on Disability and HIV and AIDS, hosted by the National Union of Disabled Persons of Uganda (NUDIPU) in conjunction with the Government of Uganda, with support from Handicap International and the African Decade Secretariat, in Kampala, Uganda, 11–13 March 2008. Retrieved November 22, 2013, from http://www.africacampaign.info/uploads/media/kampala_declaration_on_disability_and_hiv_aids.pdf. Interagency Coalition on AIDS and Development (ICAD). (2008). HIV, AIDS and disability. Retrieved September 22, 2013, from http://www.icad-cisd.com/pdf/HIV_AIDS_Disability_EN.pdf. Disability Rights Commission (DRC). (2005). A guide to the Disability Discrimination Act for people with HIV, Cancer and MS, December 2005, DRC. Retrieved October 2010, from www.drc-gb.org. Africa Campaign on Disability and HIV and AIDS (ACDHA). (2007). Report from the strategic planning meeting and official launch of the Africa Campaign on Disability and HIV & AIDS, Cape Town, January 2007. Retrieved November 22, 2013, from http://africacampaign.december.fr/about-us/main-campaign-documents.html. Ghana Federation of the Disabled (GFD). (2013). HIV and AIDS project. Retrieved February 22, 2014, from http://www.gfdgh.org/hiv%20aids%20project.html. Hanass-Hancock, J., & Nixon, S. (2009). The fields of HIV and disability: Past, present and future. Journal of the International AIDS Society, 12(28). Retrieved October 2010, www.jiasociety.org/content/12/1/28. UNAIDS. (2011). UNAIDS terminology guidelines. Revised version, October 2011. Retrieved November 22, 2013, from http://www.unaids.org/en/media/unaids/contentassets/documents/unaidspublication/2011/JC2118_terminology-guidelines_en.pdf. UNAIDS. (2012). Report on the global AIDS epidemic 2012. Joint United Nations Programme on HIV/AIDS (UNAIDS). Retrieved November 22, 2013, from http://www.unaids.org/sites/default/files/media_asset/20121120_UNAIDS_Global_Report_2012_with_annexes_en_1.pdf. UNAIDS. (2013). Report on the global AIDS epidemic 2013. Joint United Nations Programme on HIV/AIDS (UNAIDS). Retrieved November 22, 2013, from http://www.unaids.org/en/resources/campaigns/globalreport2013/globalreport. UNAIDS, WHO and OHCHR. (2009). Disability and HIV policy brief. UNAIDS, WHO and OHCHR. Retrieved November 20, 2014, from http://www.who.int/disabilities/media/news/disabilityhivpolicy/en/. United Nations. (2006). United Nations convention on the rights of persons with disabilities. Retrieved November 20, 2014, from http://www.un.org/disabilities/convention/conventionfull.shtml. WHO. (2001). International classification of functioning disability and health. Resolution of the World Health Assembly, Fifty-Fourth World Health Assembly, 22 May 2011. Retrieved November 22, 2013, from http://www.who.int/classifications/icf/wha-en.pdf.